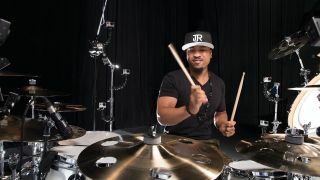 DRUM EXPO 2014: His latest gig may be backing stadium filling, hysteria inducing, high life-living mega star Jay-Z, but Tony Royster Jr is more than just a hip-hop sessioner. Far from it. Since first lighting up the drum world aged just 12 with an incredible drum solo at the 1997 Modern Drummer Festival, Royster has spread his talents far and wide, dipping his toes into the r'n'b, pop, rock, Latin, Jazz and fusion waters among many others. To date, the child prodigy-turned-drumming superstar has backed the likes of En Vogue, Norah Jones and Joe Jonas, and has performed with a slew of modern music's biggest stars from Foo Fighters to Sting, and from Eminem to John Mayer. Aside from sharing stages with A-listers he's found time to pursue a jazz career (releasing the Unwrapped Vol. 6: Give The Drummer Some solo album) and putting out two well-received instructional DVDs. And did he mention he hasn't even hit 30 years old yet? It will come as little surprise that as a man spinning so many plates, downtime is pretty much an unknown concept to Tony. However, in a rare break between touring commitments we grilled the session heavyweight on juggling big gigs, that drum solo, and holding his nerve while playing for the President. You got into drums at a very young age. Who were your earliest influences? "I got influenced early on by my father. He played drums and guitar. I used to go to all of his rehearsals at this recreational centre with his band. I'm told that one day I got up out of his guitar case and got behind the drums. "I started playing a beat in straight 4/4 time. My father couldn't believe it. That was history right there. He asked me to stop playing and then start again and I started playing the beat again. He saw that I had time at the age of three and he knew it was something special. The rest is history." "I had no lessons. It was just me and him. I would play things and he would help me put it into perspective. He'd give me a bunch of guidelines rather than me just playing all of these different things. He helped me develop my skill-set and hone my talent. He made sure I became a mature musician." "You have to know your past before you can go into the future"
Was Tony Williams a big influence for you early on? You dedicated the 1997 Modern Drummer Festival solo to him. "I saw some of his videos when I was younger. At the time I didn't really understand how big an impact he made on the drum industry, I just knew that he was an incredible drummer. That was just through word of mouth, asking other drummers and musicians, 'Who are the best drummers in the world?' Through that I found Buddy Rich, Gene Krupa, Louie Bellson... All of the legends, the peoplewho set the benchmark for drummers. You have to know your past before you can go into the future. That was my thing. "Tony Williams was one of the best drummers I've seen. Other guys like Dennis Chambers, he's one of the best drummers of all time. But when Tony passed away I saw that as the perfect opportunity for me to really show respect for what he did in the drum industry and that was my reason for dedicating the drum solo I did at the Modern Drummer festival to Tony Williams." You've crossed so many genres in your career. Have you found patterns and skills that can be transferred from one to the other? "All of the different genres go hand in hand. My Latin skills, you can apply some of that to hip-hop, believe it or not. It might just be the feel or dynamics and it's the same with jazz. I apply my skills to everything I do and that is why my father, when I was at such an early age, embedded so many different genres of music into my head. I was never limited." "I don't consider myself a hip-hop drummer, I'm a versatile drummer"
Have you taken such a broad spectrum of gigs in a conscious effort to push and challenge yourself? "I didn't start off as a hip-hop guy, I didn't start as a church guy, I didn't start as a jazz guy. I was just a drummer who wanted to play drums. At a young age I'd be listening to George Benson and then Tito Puente... All of these people. It allowed me to know where these sounds and music came from. "I don't consider myself a hip-hop drummer, I'm a versatile drummer. Right now I'm playing for Jay[-Z] but before that I was playing for Joe Jonas and before that Joss Stone. That's three very different types of music within a two or three month period. That comes from me not being limited to one style of music at an early age." What are the biggest challenges of playing with Jay-Z? "It's all about feel and dynamics. That's what hip-hop is, it's all about groove and making the music feel good. With Jay it's more about playing the records. There are times when he allows me to solo in the show - each musician has a little section to do their thing and then we go back to playing the records the producer's made. "That's gratifying to me because if I'm playing a track exactly how it was recorded, it can be more difficult to do that with hip-hop than fusion or any other music. With other music it's pretty much spontaneous; you can do what you want as long as you stay in time and play things relevant to the song. With hip-hop you can be playing a groove for 16 bars and then maybe on the 19th bar there's no hi-hat, or no snare, and that makes the music more difficult to play. That's what hip-hop artists are looking for." Is there much room for push and pull with the material live, or do you need to be tight to the record? "If you're going to do something, the room is for you to play something relevant to the music. There is no way I would play a fusion fill over a hip-hop song. It just doesn't require it. Unless I'm playing a song like Show Me What You Got and even then there's a structure to it. Jay does allow us to have fun, but it is within the boundaries of hip-hop." You've had some huge gigs with Jay-Z, but performing for President Obama must have been a highlight? "Playing for the President of the United States of America was a highlight. Playing at the World Series, the first time anybody had ever played at Yankee Stadium was amazing. Headlining Glastonbury, of course, in front of 180,000 people was great. It was a crazy experience. Those three things right there stand out amongst everything else we've done." You are obviously crossing numerous genres on your gig with Jay-Z. Have you found that you are using all of your skills across this one gig? "Not quite because I'm not necessarily playing Latin or jazz with Jay-Z, even though there are some elements of those in hip-hop drumming. The rock and hip-hop worlds merge really well together. You have Run DMC with Aerosmith, that's straight hip-hop with rock. Those two genres at least have merged together really well and it doesn't throw people off." "You need to be as versatile as possible and listen to rock, jazz, classics, everything. Don't limit yourself, keep your mind open"
How do you manage to jump from gigs with Joss Stone to Joe Jonas to Jay-Z within such a short space of time? "You have to be on your game and keep your mind open. It's about honing in and zoning into what you're doing. You have to put yourself into the music and that is how great things happen." Do you find that it takes a little time to adjust to each gig? "I have no time to think about it. If I had to take that time then I wouldn't get the gigs. It all comes back to my background and being exposed to all of these different types of music at such an early age. You have to transfer your mind from hip-hop to, okay now this is pop with Joe Jonas, then Joss Stone is more soulful so you don't have to play as much and it's more about the drum tones. It's one of those things where you get better with it as time goes on." You've had some huge gigs already, but do you have a dream gig you'd love to land? "Not necessarily a dream gig. I've had the opportunity to play with a lot of different people, even if it was just for ten minutes or so. Things like playing with the Foo Fighters or jamming at a session and someone like Stevie Wonder comes in. I've played with a lot of people but to have played with Michael Jackson would have been amazing. That would have been crazy, I would have loved to have played for him." What's the key to getting all of these great gigs? "It's about just connecting into the drum industry in general. If you tap into just being a hip-hop drummer you count yourself out of other genres. People know I'm not a hip-hop drummer, I just happen to play for Jay-Z. Jay knows I'm versatile and that I can play other things in the gig that might not even be hip-hop related. "You need to be as versatile as possible and listen to rock, jazz, classics, everything. Don't limit yourself, keep your mind open. Once you do that, all of those things will come out in your playing and that is when you start to create. "Creating your sound is what makes you unique and that is what drummers have to do. I know when Steve Jordan is playing, I know when Carter Beauford is playing, I know when Chris Dave is playing. I know because these drummers have developed their own sound. "Don't limit yourself to one genre of music. You have to be open and not afraid to take criticism. You don't have to listen to everybody, but if there is someone who has done what you want to do for a long period of time, listen to them and then apply that to whatever it is you're doing."